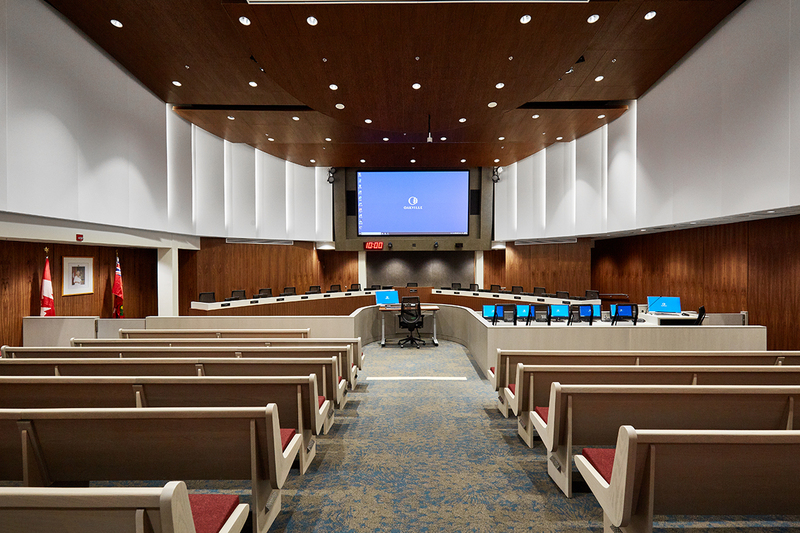 The Town of Oakville has a distinct identity, and its new council chambers is an exciting expression of this modern district. In 2019, we completed the $1.4 M renovation. A prominent community space, we transformed the 2,860 SF chambers with a technology-rich design that fostered a multi-use format. 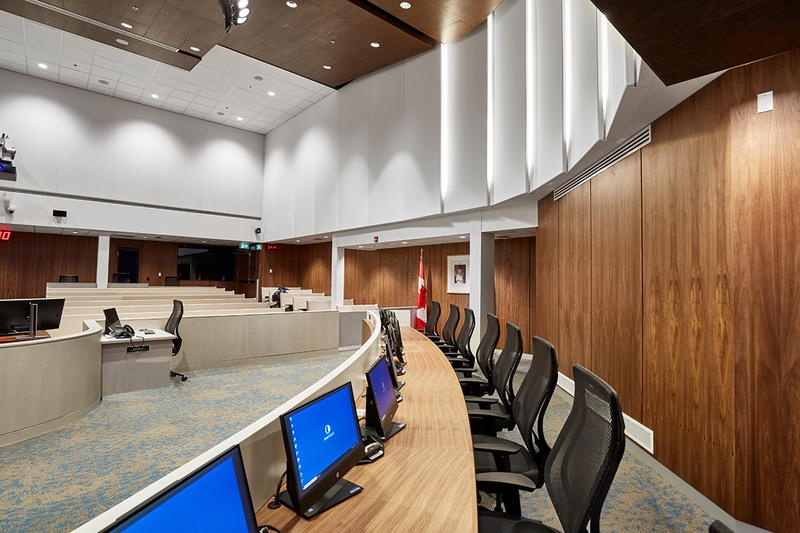 In the process, we addressed accessibility, improved access and flow for the constituents and created a flexible multi-purpose space that can be used for more than just council meetings. We began with a box, a space with no natural light and hard edges. 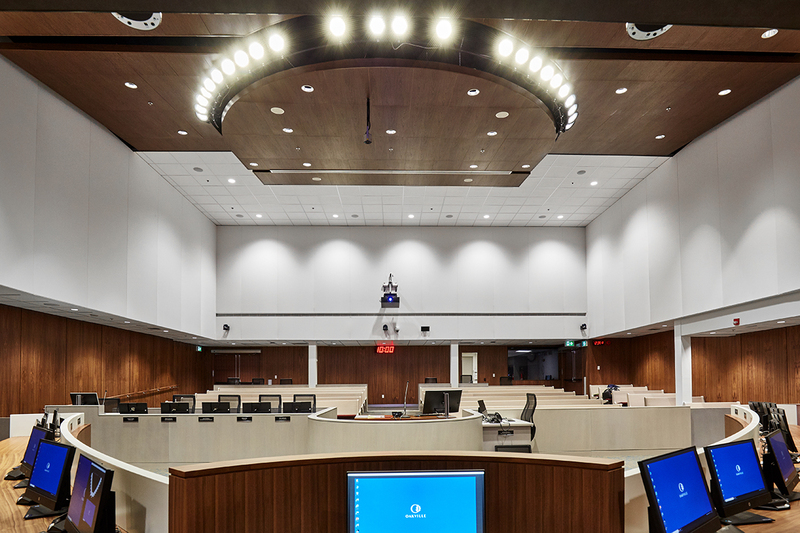 In its place, we introduced curved elements, from the shape of the councilors desk to the acoustic panels and distinctive lighting. The effect helps draw your eyes up into the spacious and bright environment. The acoustics, AV and electrical components are integrated as part of the design, giving the team control over the light levels and dynamics of the space. This helps to customize the space for multiple events and uses. The technology was a big aspect of the design and the AV very forward-looking. In fact, it was a priority of the council that the AV be current and relevant in decades, not just in years. Therefore, there are new areas for dedicated technology control and broadcasting, tucked away but still very much a part of the success of this design. Every aspect of the design was balanced against the council’s success and budgetary criteria, including significant stakeholder engagement. This included keeping the existing benches, which have been salvaged and reworked into the design such that they feel like a very intentional choice. It was also important that we maintain a sense of connection with the community. As a result, there are no obstructions between council and the benches, where constituents present to council is positioned so that they feel as if they are talking directly to the mayor.